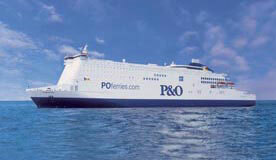 P&O Ferries operate on several routes around the UK including many sailings per day on the Dover to Calais route. P&O Ferries is one of the largest and best known ferry companies in Europe, and they have excellent customer service and onboard facilities. You can use the search facility below to book any of P&O’s ferry routes at great prices. A wide choice of ferry crossings from the UK to the continental Europe is available through P&O Ferries. They dock at gateway ports to Europe with easy access to main motorways. P&O Ferries have many advantages over other forms of travel: travellers can take motorbikes, cars, or campervans and will never have to worry about excess baggage charges. Vehicles may be packed with all the gear needed for holiday camping without any worry. Rather than beginning one’s trip stuck in an airport, in the close quarters of a train, or in a traffic jam on the roadways, a relaxing holiday begins the moment one climbs aboard the ferry. A day trip for shopping or an extended holiday break begins with a 90 minute journey between Dover and Calais with crossings leaving around the clock. With airlines offering fewer amenities and more additional charges, Dover to Calais ferries with up to 46 crossings a day provide total comfort, door-to-door access, scheduling flexibility, and quality service all the way. Every traveller can choose the time and price that fits his budget. Check-in for foot passengers closes 45 minutes before departure. Foot passengers only are limited to travel between 08:10 and 19:35 from Dover to Calais and 06:30 to 22:00 from Calais to Dover. Vehicle/passenger check-in closes 30 minutes before departure and is open to travellers with their cars 24 hours a day. (Please check and confirm times when booking). 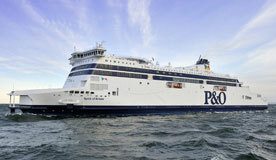 P&O Ferries’ Hull to Rotterdam route provides a gateway to Holland and Germany. Night sailings are offered on two luxury cruise ships. These offer great entertainment and delicious food in the onboard restaurants. Thanks to the comfortable en suite cabins available, each guest can be assured a good night’s sleep. Waking the next morning, the traveller has arrived at Rotterdam refreshed and prepared for beginning a holiday. Overnight departures daily make access to Holland simple and convenient. This is the ideal way to explore many of the interesting towns, cities and regions of Holland. Arnhem, the South Limburg region, Amsterdam, and De Efteling Theme Park can all make memories of a great trip. The nightly sailing schedule from 06 September 2010 to 15 January 2012 closes at 19:30 hours for departure at 21:00 hours. Arrival time in Rotterdam is at 08:15. The Ferry Spot can provide bookings for those wishing to take a pet with them on their trip (with a pet passport). Ferries also leave from Hull to Zeebrugge, Belgium; check-in closes at 17:00 hours for 18:30 departure. 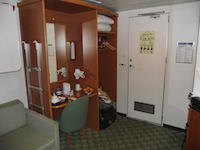 P&O Ferries’ passengers refresh themselves over-night, relaxing in en suite cabins or relaxing in the bar during the cruise ferry’s crossing. Fantastic restaurants and bars available onboard, along with live entertainment and a casino provide activities before going to sleep for the night. Zeebrugge itself is located on the sandy beaches of the Belgian coast, close to all major resorts, including Ostend and Blankenberge. Unbeatable Irish Sea crossings take place between Larne and Troon or Cairnryan. The P&O Express fast-craft takes only an hour between Larne and Cairnryan. For those who have more time there are also Superferries that glide over the sea in 2 hours, still allow time to visit all one’s favourite spots after arrival. Since there are no airport queues or restrictions on baggage, ferry travel is a great choice. With a car, Glasgow and Edinburgh are only 35 minutes from Troon. P&O Ferries sail to southwest Scotland (Cairnryan), to the west coast of Scotland (Troon), from the east coast of Northern Ireland (Larne.) A fun day out in Scotland is easy to have. The Causeway Coast and Glens are areas of unsurpassed beauty, making a unique blend of scenery and Scottish heritage, all possible through P&O Ferries.